Good, they're going after White House chief-of-staff John Kelly. He has too much control over access to Trump and is seeing to it that Trump only gets the warhawk military version on anything. I'd take the clown, yes man Mck Mulvaney over Kelly any day. 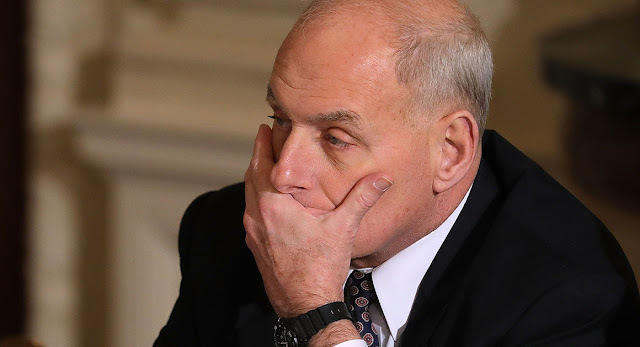 Kelly's handling of the domestic abuse allegations against former staff secretary Rob Porter is the opening that anti-Kelly White House insiders are using to try and oust him. One insider told the Washington Post handling of the Porter scandal "amounts to dereliction of duty." The official told WaPo that Kelly is a "big fat liar" for his mishandling of the allegations against Porter. Kelly, who was reportedly considering Porter for a promotion, initially defended the aide before more detailed stories of the abuse allegations emerged, including those with photos showing Porter's first wife with a black eye. Oh no! Wapo says the something is wrong in Trump's Whitehouse! With their credibility being immaculate, I would presume this is all 100% factual and that this is not yet another story to create instability and uncertainty in the Trump Whitehouse that Wapo has been on a crusade for 2 years to destroy. That has nothing to do with this absolutely true story. Kelly sealed his fate when he signed off on releasing the House FISA memo. This is how deep states work.